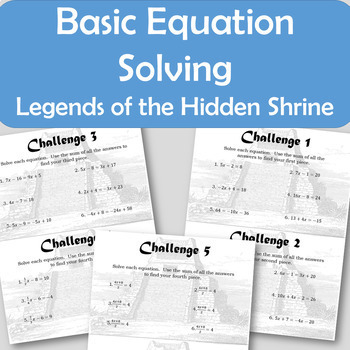 Let your students practice their equation solving skills by having them work through problems to try and escape the hidden shrine. Students will solve equations that will lead them to different pieces of the amulet. Once students have found all the pieces of the amulet they must put them together for victory. Watch out though, if you choose the wrong answer, you may be caught by the hidden monkey guards! This practice will require students to use their knowledge of basic equation solving. Each challenge will require a different set of skills. Students will need to solve basic two step equations, combine like terms, and use inverses for solving with fractions. Want to earn TPT credit for future purchases? You can provide feedback in the “My Purchases” page. Just click “Provide Feedback” and leave a rating. TPT will give you feedback credits to use towards future purchases every time you leave a review. Follow our store by clicking the star next to the logo. This will keep you in the loop for upcoming sales, new items (free too)!